The Barnburners were the radical faction. 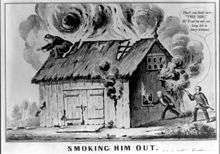 The term barnburner was derived from the idea of someone who would burn down his own barn to get rid of a rat infestation, in this case those who would destroy all banks and corporations, to root out their abuses. The Barnburners opposed expanding the public debt, and the power of the large, state established, corporations (the Barnburners were not opposed to large business enterprises due to their largeness - only ones established or subsidized by government); they also generally came to oppose the extension of slavery. They also stood for local control by the Albany Regency, as against the Polk political machine which the new administration was trying to build up in New York. Among the prominent Barnburners were Martin Van Buren, Silas Wright and John A. Dix. At the 1848 presidential election, the Barnburners left the Democratic Party, refusing to support presidential nominee Lewis Cass, and instead joining with other anti-slavery groups, predominantly the abolitionist Liberty Party and some anti-slavery Conscience Whigs from New England and the Midwest, to form the Free Soil Party, which nominated former President Van Buren to run again for the presidency. Their vote divided the Democratic strength and secured the election of Zachary Taylor, the Whig nominee. After the Compromise of 1850 temporarily neutralized the issue of slavery and undercut the party's no-compromise position, most Barnburners who joined the Free Soil Party returned to the Democrats. 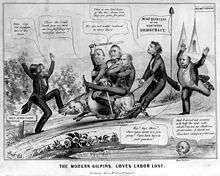 In 1854, some Barnburners helped to form the Republican Party. The Hunkers were the conservative faction. They opposed the Barnburners, and favored state banks, internal improvements, and minimizing the slavery issue. The term hunker has obscure origins, but probably came from the Dutch word honk, meaning “post,” “station,” or “home.” It was basically a synonym for “stick in the mud,” and became a contemptuous nickname, like “mossback,” for the unprogressive members of a party, which detested change. Among the leaders of the Hunkers were Horatio Seymour, William L. Marcy, Samuel Beardsley, Edwin Croswell, and Daniel S. Dickinson. ↑ OED, citing the NYTribune of 1848. Gilman, D. C.; Thurston, H. T.; Colby, F. M., eds. (1905). "Barnburners". New International Encyclopedia (1st ed.). New York: Dodd, Mead. Rines, George Edwin, ed. (1920). "Barnburners". Encyclopedia Americana. Gilman, D. C.; Thurston, H. T.; Colby, F. M., eds. (1905). "Hunkers". New International Encyclopedia (1st ed.). New York: Dodd, Mead. Rines, George Edwin, ed. (1920). "Hunkers". Encyclopedia Americana.